The SharkBite Water Softener Hose is an easy solution to connect your water supply lines to your water softener system to. 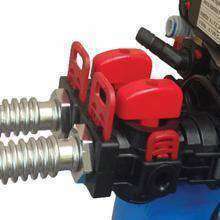 The hose has a FIP swivel nut connection and a Push-to-Connect connection on the other side making installations quick and easy. Choose the size that fits your needs. This hose is rated for 200 psi and 200°F.